On a windy exposed prow high above the iron-rusted desert floor, I climbed nervously toward the first piton. It is the infamous runout of pitch four of Otto’s Route on Independence Tower in Colorado National Monument. Sixty feet of un-protected climbing on a narrow, slick spire. My heart was roaring in my chest, palms damp from adrenaline. One slip now would send me careening over the edge one hundred and fifty feet to the Lunchbox Ledge below. “You’re doing great!” Ella, my belayer and wife, yelled up in my direction. I wanted to believe her, but how could she be so sure? The hardest part was still ahead. I placed each foot with intense care, battling the sensation I was tap dancing with disaster. Finally, the first piton was in front of me and the carabiner snapped as the rope dropped into place. An elephant of anxiety fell from my shoulders. “I’m in,” I yelled down. The summit was tantalizingly close, but between me and success was twenty feel of over-hanging sandstone pocked with big but slippery holds. The spire’s phallic exposure caught up to me all at once. For a moment I could have been floating. It seemed like nothing but air was all around. The desert’s exhale filled my ears. Relax, I commanded myself. But instead of taking my own advice, I peered nervously down the sheer, three-hundred foot drops to each side. With a deep exhale, I climbed towards the infamous and exposed crux. On Independence Day 1911 a man named John Otto planted the American flag atop the tallest free-standing feature in the newly minted Colorado National Monument. He’d reached the top of Independence Tower by chipping steps and drilling two-inch holes to install a serpentine pipe-ladder all the way up the majestic maroon pinnacle. Without a belayer but occasionally using a hemp rope as an anchor, Otto completed the astounding feat using a miner’s hand drill, a hammer and a set of cowboy boots. Little did he know as he chopped his way skyward, that not only was he cementing his own place in Colorado history, he was creating what would later become one of western Colorado’s most classic multi-pitch rock climbs. 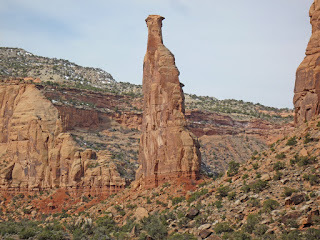 But the feature that drew his eye more than any other was the impressive 300-foot spire that sat alone and proud in the open basin between Monument and Wedding Canyons. Sticking with his fervently patriotic theme, Otto named the feature Independence Monument and lived for some time in a tent at its base. By then Otto had already developed a taste for expressing his strongly American sentiment by planting flags atop other park features, such as Liberty Cap, a rounded, petrified sand dune stationed prominently in the park’s center, east of Monument Canyon. But Otto’s eye had already been turning upward for something greater. Higher still, I clipped the second piton. Just a few more moves and I would be on top. The rock was getting steeper, angling towards the overhanging summit cap ten feet higher. Hesitating on a large handhold, I worked my feet high on the sandy pockets and pulled myself up toward overhanging bulge. 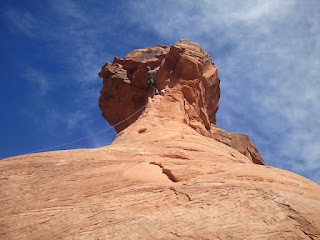 Though Otto’s Route is rated 5.8 in most guidebooks, I had never climbed a 5.8 overhang. My left arm was shaking as I tapped frantically with my right hand for something, anything, to grab on to. My grip was slipping; my sweaty fingertips no longer able to stick to the powdery rock. But just as I considered yelling “FALLING!” and allowing myself to peel off, my pointer and middle fingers slide home into an unseen and unnatural pocket punched out by John Otto all of those years ago. An acrobatic pull-up later and I was atop the belay ledge at the anchor. “I’m in!” I yelled down, clipping in my daisy chain to the safety of the steel bolts. As Ella prepared to climb, I basked in the magic of the place where I stood. All the hard work, the two-and-a-half mile hike, the four pitches of climbing, had led to this. Standing to the south was the Kissing Couple, perhaps the most distinguishable formation in the canyon other than Independence. And to the west the Coke Ovens, another impressive collection of sandstone spires. The wind was blowing but the sun was out. And since most of the route had been in the shade, it felt good to warm my bones under the October sun. “Okay! On belay!” I tugged the rope through the belay device as Ella picked her way up the prow to join me. There are people that call Otto’s Route a classic. And those who considered it a sandy, chipped abomination. Every year hundreds, perhaps thousands, of rock climbers climb their way up the shaded face of Independence Monument, following in the literal footsteps of an American pioneer. But many more avoid the route as if it were contagious, cursing the crowds, the relatively modest 5.8 grade and the overly manufactured and unnatural essence of the climb. As for myself, I think of Otto’s Route as history. In modern days, such climbing ethics would be blasphemous. But 104 years ago, when Otto first stepped atop this astonishing pinnacle, the world was a far different place. “Woo-hoo!” Ella cheered as she mantled over the summit cap to join me. I reeled in the last of her slack. “What do you think?” I asked as she tied herself in to the anchor. Surrounded by an ocean of cliffs and pinnacles, “amazing” sounded just about right.